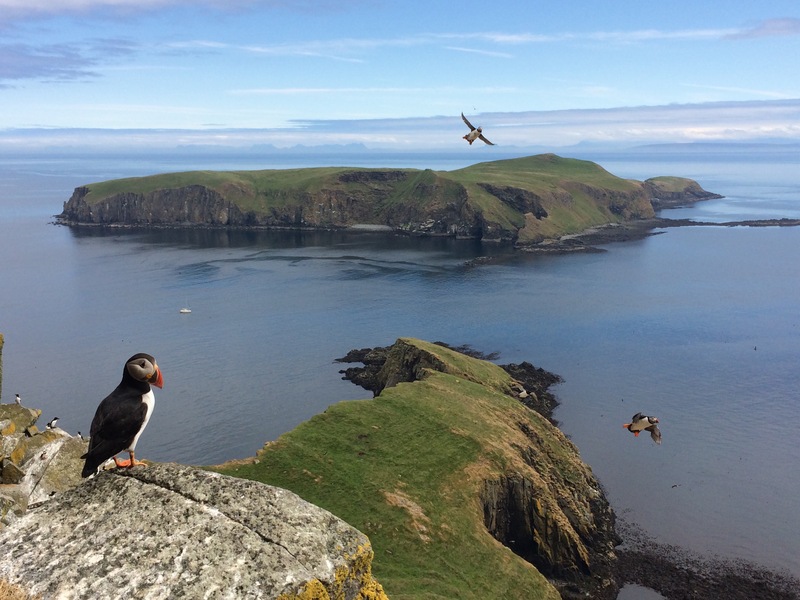 This is one of a series of blogs from a stay of a week on the Shiants with a teenager, helping out (inexpertly) with some of the RSPB’s work in the islands and falling in love with a magical place. Today’s task was checking rat bait stations around Garbh Eilean (Rough Island). The island was declared officially rat free in February 2018 after the requisite 2 years since a rat was last detected. But the monitoring effort continues and a number of permanent monitoring stations have been set up on the islands. These consist of a cosy sheltered box with small openings to let the rat in and a round puck of chocolate-flavoured wax with a wire through its middle secured inside. The team took DNA samples from some of the rats from the Shiants during the eradication. This is so, if rats are picked up by the monitoring stations, they can test whether they are a new invasion or come from a remnant of the original population that managed to hide out somewhere. Jonny shows us photos of marks made by birds, shrews and mice and then we are issued with our GPS loaded up with the coordinates of each monitoring station and head off. We are trying our novice geocaching skills on a complex slope of steep boulders, cliffs and slippy, dropping-slicked grass. 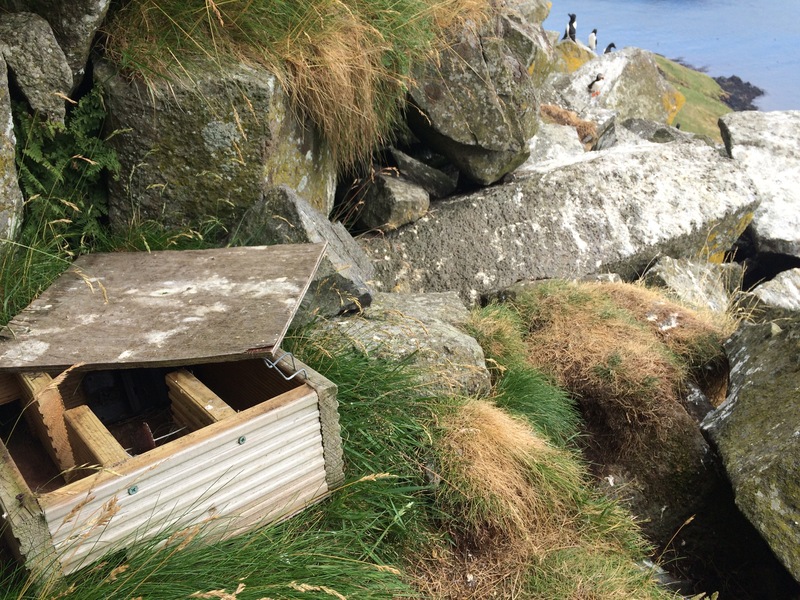 The footholds in the grassy bits consist of tufts that have become regular perches for puffins and have become flattened and covered with poo. Every now and again a disused burrow makes a secure handhold if you jam your arm right into it up to the armpit. The boulders feel slightly more secure having good sharp edges to hold onto but every now and again a boulder shifts and you are keenly aware that hundreds of thousands of tonnes of boulders are balanced at an angle of 30degrees against a cliff that is still adding boulders to the pile each winter. Fortunately the teenager refuses to come into the colony again (“the smellllllll. It’s just so discussssting”) so I only need to worry about my own wellbeing. We start up the GPS just before the scamble in to the colony. The GPS tells me our first monitoring station is only 2m away but there is nothing in the short cropped grass and crags despite a good search. After a while looking around we head down the scramble and, there it is, vertically below where we were searching. This theme continues through the morning in the complex topography of the Boulder field. 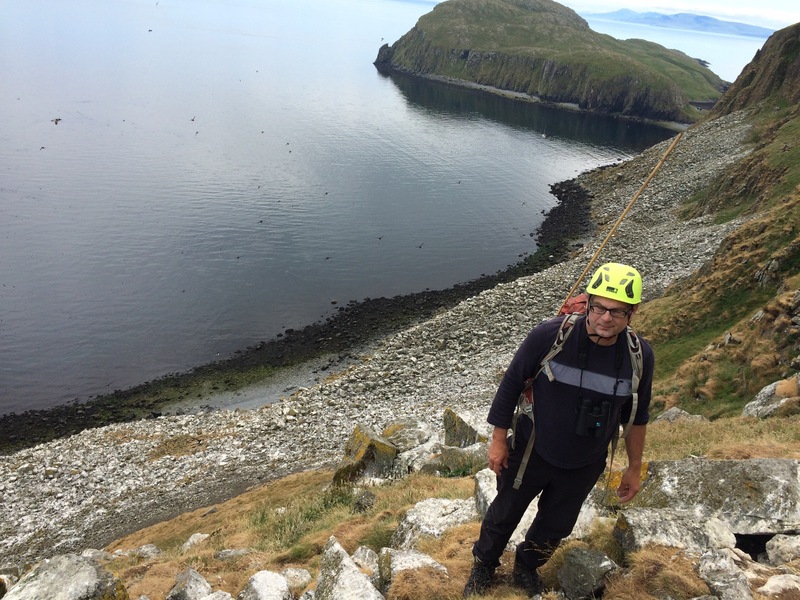 Several times we reach an impassable grassy slope or cliff face and have to back track precariously to find another route to get to our quarry. Eventually I declare this three dimensional maze to be too challenging for a pair of novices who don’t know the route and we retreat from the boulder field and head to the old ruined settlement at the other side of the island for another set of monitoring stations which the teenager romps through like she was born to be a rat station geocacher. We had been tasked with checking around 20 stations, a fraction of the 300 bait stations the eradication team had in the boulder field alone. 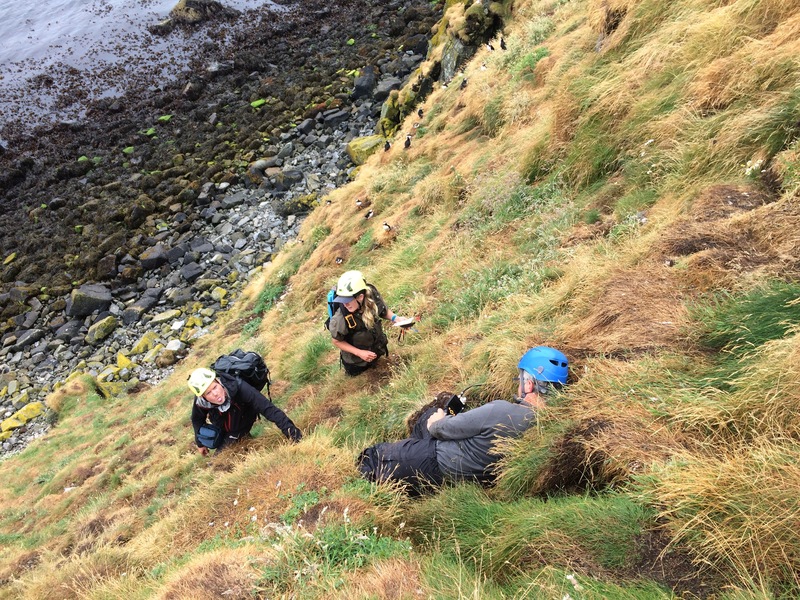 In perfect conditions we had found the steep slippery grass utterly treacherous and I wondered how the team had made their way across it in winter to check and replenish their bait stations during the eradication. Jack and Jonny, who were both there on the project since the beginning, are quietly understated about the privations of a winter on the Shiants. They would spend a week at base camp covering the rat stations on Garbh Eilean and Eilean an Taighe (House Island) and then a week across the kilometer of water stirred by fierce tidal currents on Eilean Mhuire (Mary Island). There they would stay in a single cabin secured down with straps to concrete blocks. “We went out most days” said Jack. “But when it was blowing more than a force 8 the rope access team couldn’t work as it was too dangerous”. After two weeks on the Shiants the team would have a week in Harris with access to hot water on tap, central heating, flush toilets and Internet access. The teenager perks her head up at the mention of Internet access “where can I get Internet access?” She asks. It turns out that she could possibly get a 3G signal at the very top of Rough island, around a half hour’s walk. “If you’re lucky” says Jonny. Do you know that I actually took this photo with my phone while clambering around between looking for bait stations? I was pretty amazed when I saw the result. 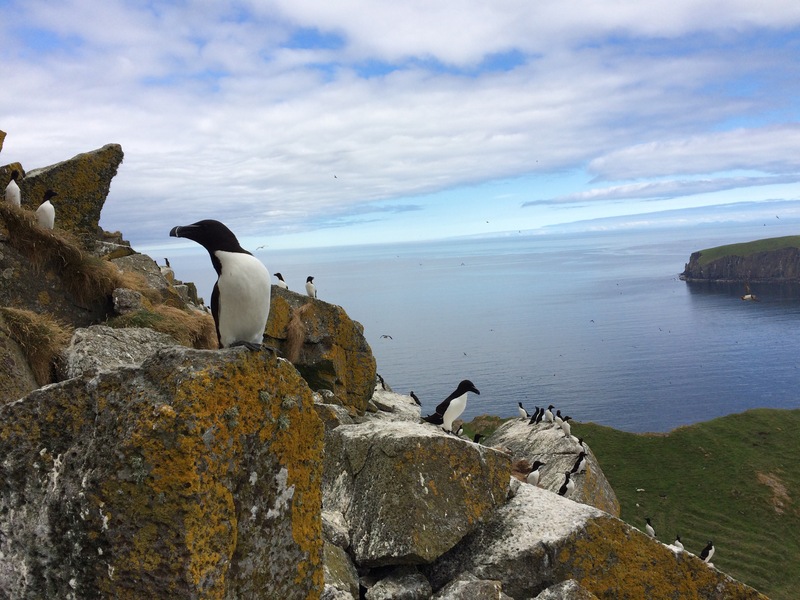 This entry was posted in Miscellaneous, Uncategorized, Work and tagged rat eradicaton, Rat monitoring, Shiant Islands, Shiants by nager. Bookmark the permalink.